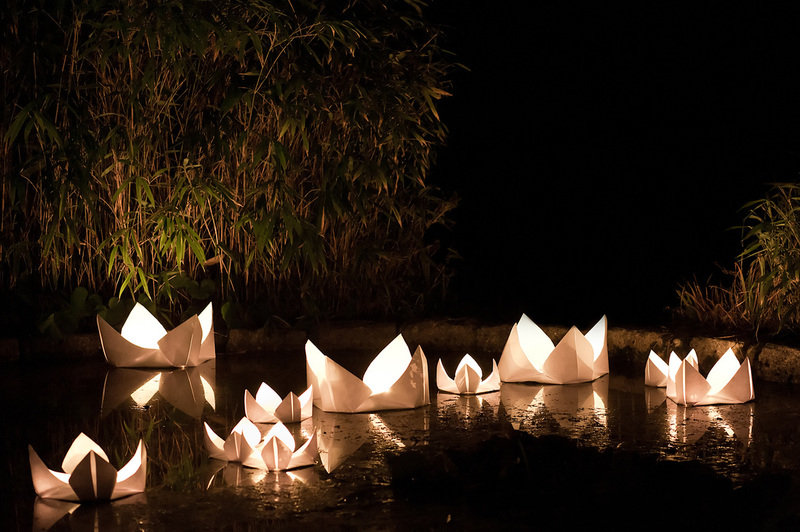 As an installation artist, art director and workshop leader, Coco Sato travels extensively to showcase her unique “Giant Origami” installations and run workshops at festivals and events. Her innate feel for artistry and craftsmanship is evident in all of her projects. She makes hand-crafted objects that show soul and tell a story. Her work is deeply rooted in Japanese culture yet the simplicity of her designs makes them timeless and versatile – they could exist in any era. What are your driving forces? Motivations? Muse? Introducing and sharing timeless Japanese aesthetics with a global audience. Reinterpreting Zen philosophy to be understood easily and to help incorporate it in everyday life. 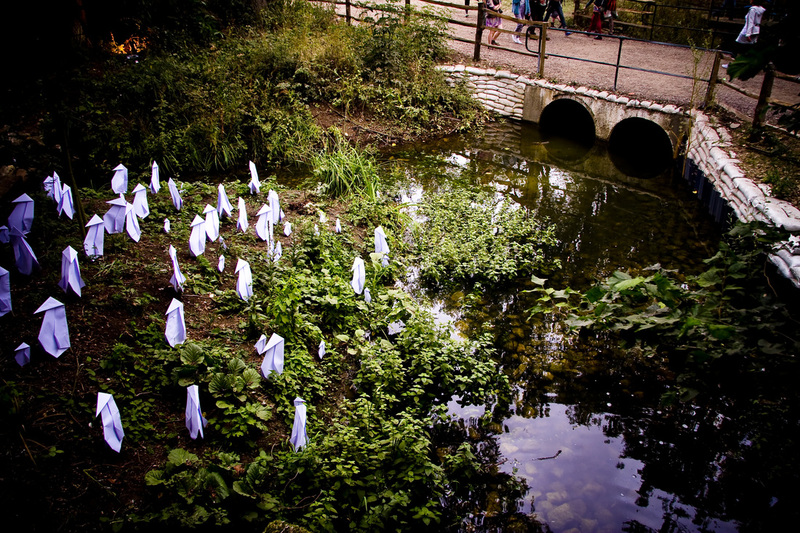 Combining art and technology to encourage community interaction. Artisans, scientists and engineers. I am inspired by people who are committed to making a positive impact in people’s life whether that is in the field of arts or science. I am inspired by fine details of everyday objects that are used for generations - items people continue to embrace because they are at once practical and beautiful. My travels have taken me around the world, at every destination I investigate that culture's traditions, rituals, arts, textiles and crafts; I pay close attention to the dominant colours used therein. There are many artists I admire. To name a few, I love Burning Man artists, David Best’s Temples and Jen Lewin’s interactive installation, Pool. Why Origami? How did you get here? It was autumn 2009, I had quit a job at a mental health practice and was looking for a way of combining my skills and background, motherhood and getting back to art and design industry. I started teaching origami to children and adults in Brighton UK. I was demonstrating origami step by step needed to be seen from distance, I naturally made it big, and here Giant Origami was born! I have been experimenting with Sonobe unit origami since winter 2012. In the beginning, I was just making cubes or icosahedrons for which I found tutorials on Interweb. I found new freedom in creating through combining colours within the constriction of using uniformed units. I got so good at it, I decided to make it more challenging for myself and ‘Giant’ by assembling a few hundreds of units together. 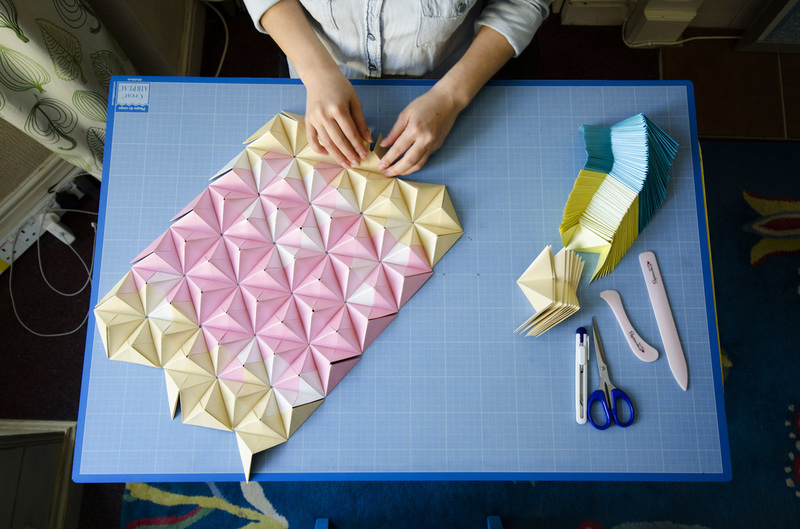 "Origami is something everyone does with family and friends in Japan; it’s a creative play that is deeply rooted in Japanese culture." What was your first project with origami? Origami is something everyone does with family and friends in Japan; it’s a creative play that is deeply rooted in Japanese culture. However I recall, the very first project of origami must have been making paper wonderland, dolls and doll house furnitures with my mum and brother when I was little. At that time in Japan, Sylvanian Families, a line of collectibles based on the concept of dollhouses and anthropomorphic animal figures, were really popular and I created ‘paper friends’ and ‘paper bed and desk’ for the rabbit and squirrel family I treasured. How do you decide what colors you will use? 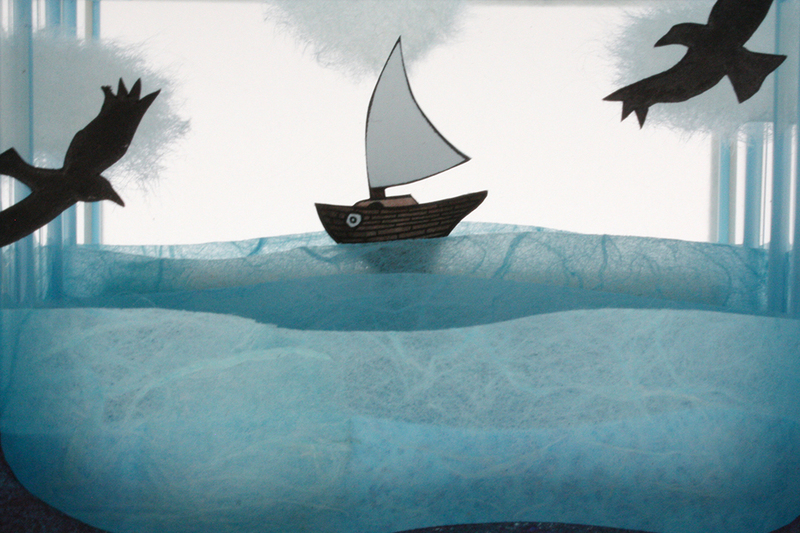 I try to make the colour to be ‘felt’ as well as ‘seen’. I would love to brighten up your life, whether that is to evoke a warm feeling of summer, bringing a cool atmosphere of serenity or ignite the burning desire within. Use of colour is a prominent force of my creativity. I am endlessly inspired by my surroundings; whether that is my immediate environment or inspirations which I collect through my traveling. And of course my childhood memories of Japan where there are four distinctive seasons, each filled with colourful traditional festivals that celebrate beautiful nature and local customs. How long do you spend on each piece and do you work on them simultaneously? When I work with Sonobe units, the initial folding stage is the time consuming part. Sometimes I get so bored with the repetitiveness and force myself to JUST DO IT. Fun part begins once plenty of units in variety of colours are folded, then I just let my creativity flow. It’s like playing with LEGO. You can build a shape, deconstruct a part of it or add some more here and there. The process is spontaneous, intuitive and fun, and for me it’s almost meditative. Do you sketch or plan them out? I create mood board every now and then to find my new focus, and have a digital photo library that I have built over time that are both my memories as well as inspirations. I treat Sonobe units like LEGO. I have folded thousands of units in different colours over time and nowadays I pick and choose the colour from that stock to create infinite variations of Sonobe unit wall pieces. What other materials other than paper, have you used? I love the way paper is easily obtained. 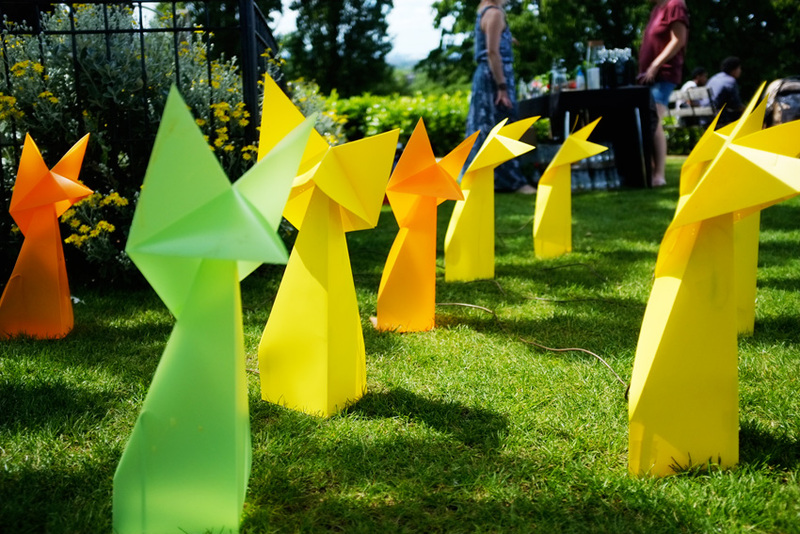 It’s so versatile and I don’t need special tools to create something from a sheet of paper however I use plastic sheets when constructing outdoor installation and for my product range. I love food, so I have played with pastries, nori seaweed(sushi), sliced cheese, wraps and dumplings and my friends and family love them! Origami food is something I would love to experiment with more. "I decided to go studio free to live a minimal life. The decision did not come easily....but I realised that Macbook Pro, iPhone, Fuji x100, Moleskine, and colourful paper and small tools are all I need to create and stay connected with people around the world." 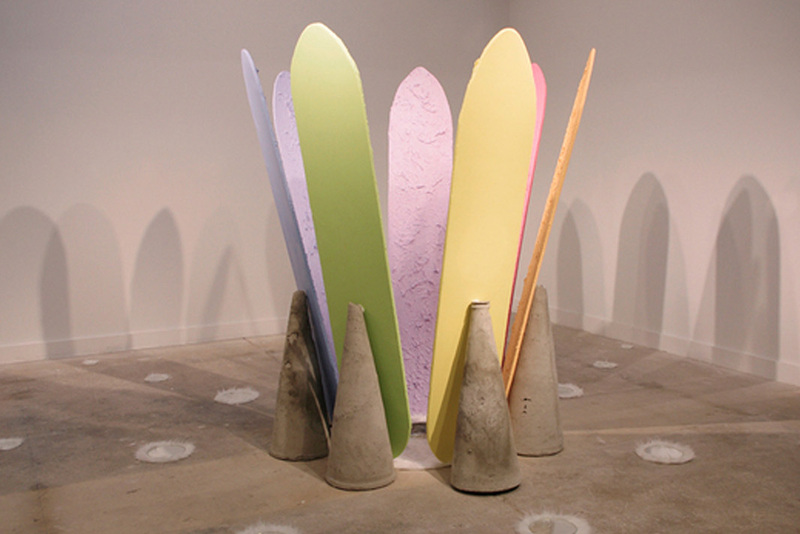 When did you decide to do site specific installations? It was a true ‘Being at the right place at the right time’ moment. One cold winter day on a train from London to Brighton in February 2010, I started chatting to a woman about my giant origami workshops and my wild idea of creating an installation. She LOVED the idea, and happened to be the Creative Director of Secret Garden Party (UK’s alternative to Burning Man Festival). she suggested that I apply for their arts grant and showcase Giant Origami installation at Secret Garden Party . How was your first installation experience? 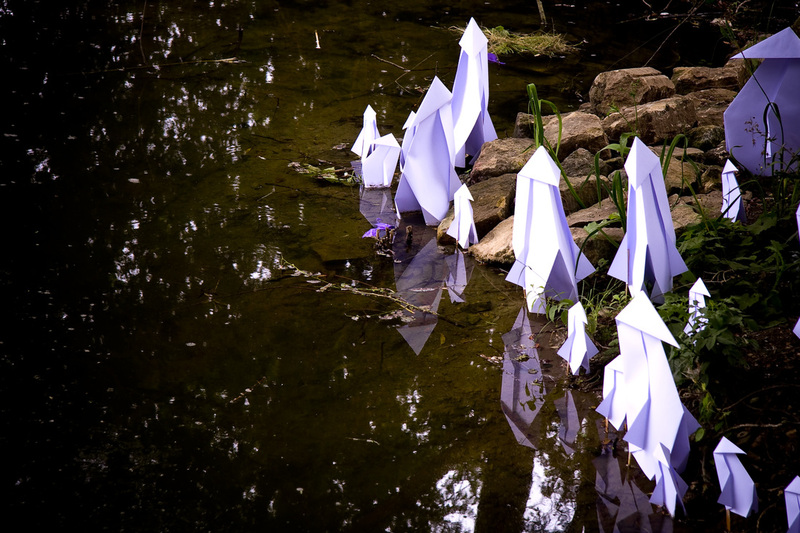 When I was awarded with grant from Secret Garden Party to create Giant Origami installation, I was sooooooo ready. The last show before this was my Fine Art graduation show at Central Saint Martins College. After graduating, I worked in photography and print design, then few years devoting my time for my son and working for a mental health practice part-time. After a long hiatus from creative industry I felt like it was the perfect time for me to find my style and create my own mark. Having experience in other areas in my life, I am more focused than ever, and appreciate having the time to concentrate on my art. When did your interest in art peak? When did you know this was what you wanted to practice? My love of travel took me to different parts of the world. Everywhere I went I was excited about knowing people were simply fascinated by Japanese culture and at the same time I was frustrated by how Japanese culture was viewed in the stereotypical manner such as traditional images of Geisha and Sumo wrestler, and bright neon signs of Tokyo and Toyota hybrid cars. I simply wanted to act like an ambassador of Japanese culture and art, and inspire people by showing something more rooted in everyday life of Japan. I thought origami was the perfect medium to represent what I was trying to do. I’m working on radically scaling up Roborigami project. I cannot tell you in details yet but this is going to be super awesome. I now have an app developer and sound artist on board as well as very talented collaborators of four years Ad, the robotics engineer, and Pete, the user interface designer. 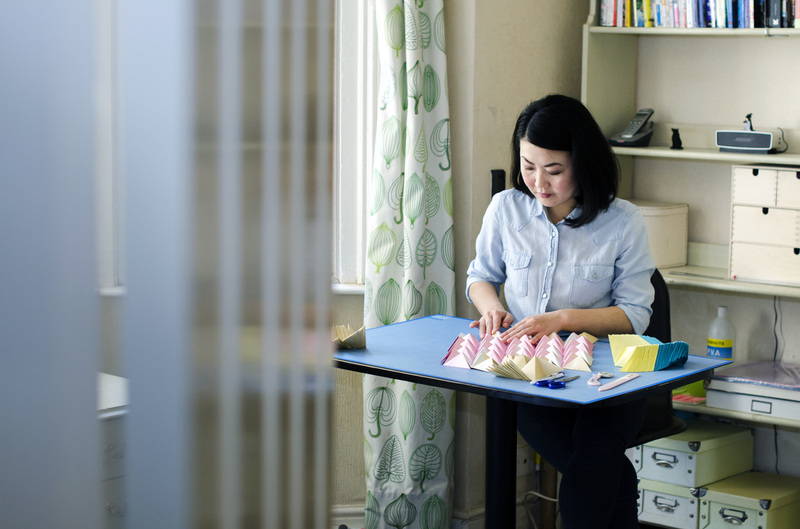 Speaking about my daily life, I take on commissions that I hand make, spend time writing and creating marketing material to promote Giant Origami and Roborigami as well as running workshops and speaking at events. I also offer WordPress Web Development service, so staring at laptop screen takes up a lot of my time too. In February 2015, I decided to go studio free to live a minimal life. The decision did not come easily since I live in a small apartment with my son, but I realised that Macbook Pro, iPhone, Fuji x100, Moleskine, and colourful paper and small tools are all I need to create and stay connected with people around the world. My simple life shaped up to be minimal expense and more free time and money to actually enjoy life. Nowadays I work from my (tiny) apartment in the city of Brighton UK, I create on a small table that doubles as a dining table. It makes me motivated to finish work before dinner time and tidy up each day. There is an under-bed space where I keep my suitcase filled with paper and small tools. I am really enjoying how simple my setting is. When it’s sunny, my apartment is filled with abundant natural light and I take all my photos by the window. This morning I was working on Sonobe wall piece commission from my apartment. I am currently typing answers for this interview in a converted church cafe in my neighbourhood. When I’m in need of friendly company I take my macbook pro to MakerLab studio where I also teach monthly origami robot workshop. Have you collaborated with another artist? 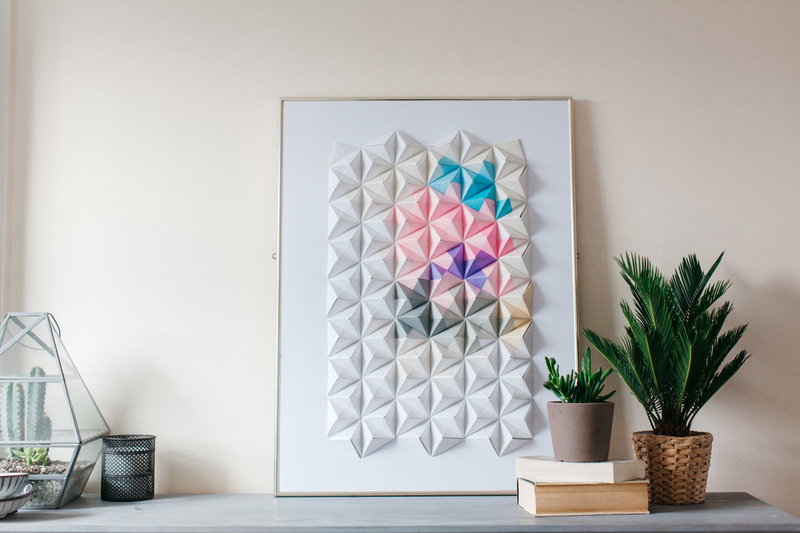 I had lot of fun folding illustrator/print designer Natasha Coverdale’s print for some of my Giant Origami pieces. 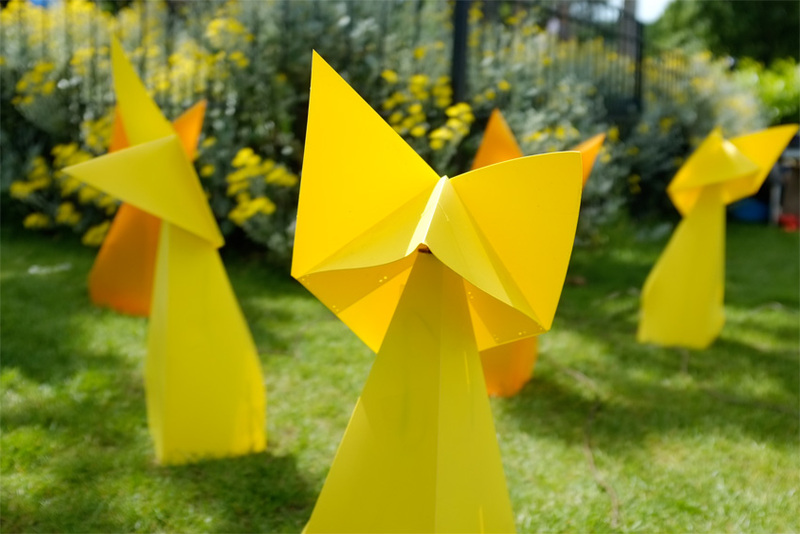 After a very successful first year touring festivals and teaching Giant Origami, I was looking for a way of making my installation more playful and fun. It was another ‘Being at the right place at the right time’ moment. Pete and Ad were showcasing their robotised haptic lotus at Secret Garden Party, and they saw my fox installation there too. My current mission is to connect with global audience, so my main focus is my Instagram gallery and interweb features such as this one. Sharing my work via social media and Interweb is amazing. 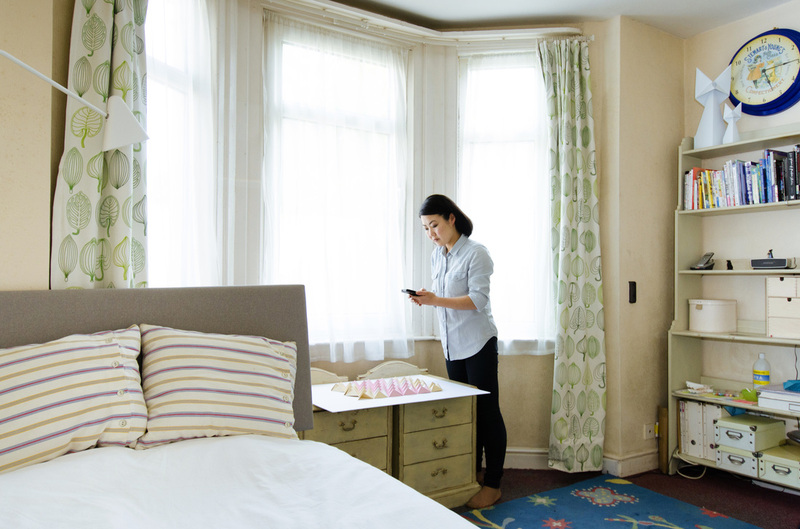 I am here in Brighton UK and I can connect with thousands of people around the world instantaneously. I will send you a printable gift when you sign up to my fortnightly newsletter and follow me on Instagram. I will keep you updated! For more on Coco, read this Little Story about her journey.